Every year all the national food magazines tout new ways to roast turkeys to make them more flavorful and juicy. I have taught this method to my students for more than 15 years and have never had one complaint about dry or tough turkey. 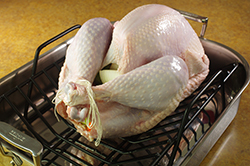 The most recent fad is “brining” or soaking the turkey in a salt-water solution overnight. The turkey absorbs the brine, becoming juicier, but it also gets saltier and the texture of the meat changes. And you can’t use the drippings from a brined bird, as they are too salty to add to the gravy. If you want to try a brined bird, roast a kosher chicken and see if you like the texture of the meat. If you do, then buy a Butterball or kosher turkey for Thanksgiving because both have already been brined, saving you the mess of a huge container of salted water and a floating turkey. Also, buy a fresh turkey if at all possible. Your local grocery stores will be practically giving away frozen turkeys, and there’s a reason for that. I usually pick up a frozen bird and donate it to a shelter or keep it in the freezer and cook it later in the year for a regular dinner. A fresh turkey has better flavor and texture, and I think it’s juicier. If you do buy a frozen bird, however, you should defrost it in the refrigerator for three days. 1-1/4 pounds per person if I want to send people home with doggy bags. I also recommend that you don’t cook a bird over 18 pounds, because when turkeys get that large the ratio of meat to bone throws off your timing and the bird will be dry. If you need 24 pounds of turkey, roast two 12-pounders; they are more tender and cook in less time, and you’ll be happier. Make sure to buy an instant-read thermometer to gauge whether the turkey is cooked – the little plastic thermometers that come imbedded in turkeys sold commercially work on a moisture principle, so when that thing pops up, your turkey has turned to jerky! I think sparkling Pinot Noir is delicious with this turkey, You can also serve regular Pinot Noir, Merlot, or Syrah. 1. Remove the neck and giblets from the turkey and set aside for other use if you wish, or discard them. 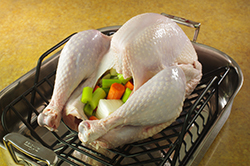 Rinse the turkey inside and out under cold running water and pat the inside and outside dry with paper towels. Sprinkle the cavity liberally with salt and pepper. Diva Do-Ahead: At this point, you can cover and refrigerate for up to 3 days. Dry the inside of the turkey again if you store it for any length of time. 2. Preheat the oven to 325°F. Put the celery, carrots, and onion inside the cavity and tie the legs together with kitchen twine. (If you would like to stuff the turkey, put the stuffing into both cavities, and then tie the legs together with twine and fold the skin flap over the other cavity so that it rests underneath the bird.) Transfer the turkey to a rack in a heavy-duty roasting pan. 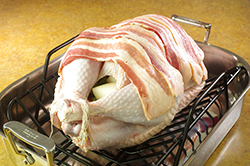 Drape the bacon over the turkey and roast for 1-1/2 hours, then remove and discard the bacon. Continue roasting until an instant-read thermometer inserted into the thickest part of the thigh (behind the drumstick) without touching the bone registers 170° to 175°F, another 1-1/2 to 2 hours. If you would like to baste the turkey with pan drippings, start doing so after 2 hours. If the turkey is browned to your liking before it reaches 170°F, loosely tent it with aluminum foil for the duration of the cooking time. 3. Remove the turkey from the oven, transfer to a cutting board, and cover with foil. Allow the turkey to rest for at least 30 minutes, then carve. Maple-Glaze Turkey: Follow the basic recipe, but baste the turkey with 1/4 cup of pure maple syrup during the last hour of cooking. Cider-Glazed Roast Turkey: Omit the onion, carrots, celery, and bacon. Stuff the turkey with 6 cored and quartered Gala or Golden Delicious apples. In a 2-quart saucepan over medium heat, combine 2 cups apple cider and 1/2 cup firmly packed light brown sugar and stir until the cider is hot and the sugar dissolves. Diva Do-Ahead: At this point you can cool and refrigerate until ready to use, up to 2 weeks. Brush the turkey liberally with the cider syrup before it goes into the oven. Roast the turkey as directed, basting with more of the syrup every half hour. Discard remaining syrup. Hoisin-Glazed Roasted Turkey: In a large bowl, combine 2 cups hoisin sauce, 1/2 cup soy sauce, and 1/2 cup rice wine or seasoned rice vinegar until smooth. Divide the sauce in half, refrigerating one half and painting the turkey liberally with the rest. 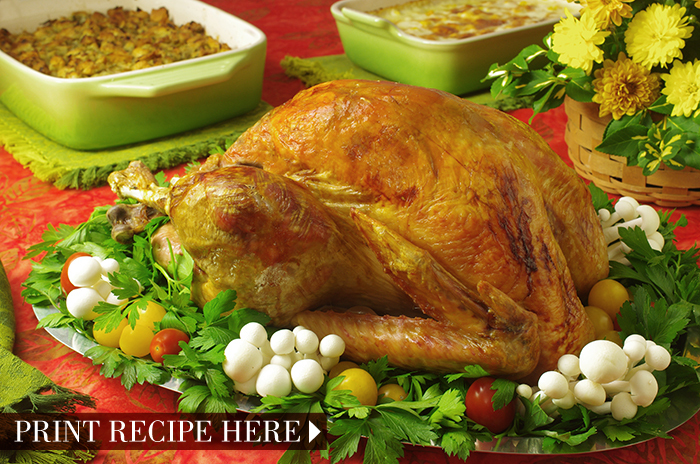 Diva Do-Ahead: At this point, cover and refrigerate the sauce and turkey for at least 24 hours and up to 3 days. Bring to room temperature before continuing. 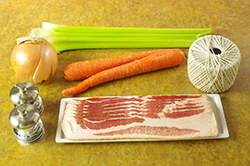 Substitute 6 scallions, chopped, for the onion and omit the celery and bacon. Stuff the turkey with the scallions and carrots and roast as directed, basting with the reserved hoisin glaze every half hour. Transfer the roasted turkey to a cutting board, drizzle with 1/4 cup toasted sesame oil, cover with aluminum foil, and let rest at least 30 minutes. Carve and serve with warm flour tortillas, more hoisin sauce, and chopped scallions, as you would Peking duck. Thyme-and-Sage-Rubbed Turkey: Omit the bacon. Combine 1 cup (2 sticks) of unsalted butter, melted, and 2 tablespoons each of chopped fresh thyme and sage and brush it liberally over the turkey; keep the butter warm over very low heat. Roast the turkey as directed, basting every half hour with the herbed butter baste. Discard remaining baste. The following estimates are for roasting a turkey in a conventional oven preheated to 325°F. Remember the internal temperature, not the cooking time, is the only accurate way to know if the turkey is done. The stuffing should register 165°F on an instant-read thermometer, and the turkey should register 170 to 175°F at the thickest part of the thigh or breast. Everyone asks me if you can roast turkey ahead of time. The answer to this question is yes and no. It’s not my first choice, but you can do it, and it comes in handy if you need to roast more than one turkey. Roast one turkey the day before according to the directions above., allow it to cool, and slice the meat. 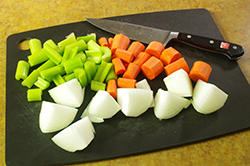 Arrange the meat in a baking dish and pour 1/2 to 1 cup chicken or turkey broth over the turkey. Cover with aluminum foil and refrigerate overnight. On Thanksgiving Day, roast another turkey as directed. When the turkey is roasted, remove from the oven and let it rest. 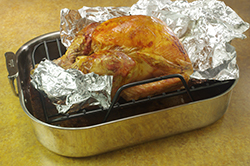 Have the baking dish with your do-ahead turkey at room temperature and bake at 350°F, covered with aluminum foil, for 20 to 30 minutes until heated through. Carve the freshly roasted turkey and serve that first, then for second helpings serve the other. Reprinted with permission from Happy Holidays from the Diva of Do-Ahead by Diane Phillips. Copyright 2006. Published by Harvard Common Press, Boston, MA.